A combination TDR to test both twisted pair and coaxial cable. By way of front panel connectors, directly test coax cable and twisted pair cable without the need for adapters. A front panel BNC connector provides the sensitivity and length readability to find small coaxial cable problems. Dual Banana Jack connectors give maximum versatility and convenience with multiple testing modes for twisted pair cable. Riser-Bond Instruments has taken waveform storage and documentation to a higher level. Together, SUPER-STORETM and WAVE-VIEWTM for Windows software make an already outstanding TDR even better. SUPER-STORETM is the ultimate in waveform storage, comparison, and recall. Both on-screen and off-screen cable waveform infomation is stored. Recall the waveform and move the cursors, change the VOP, and increase or decrease the gain settings. Use your computer and WAVE-VIEWTM for Windows software as an extension of your Riser-Bond TDR. Waveform information can be archived, documented, manipulated, compared, or analyzed on your PC while your TDR goes back into the field, working for you! WAVE-VIEWTM not only allows you to recall stored waveforms on your PC, but it also displays the TDR's function keys. You can actually increase the vertical gain, zoom in and out, manipulate the waveform, adjust the cursors, and change VOP, right on your computer! Try that with any other TDR! 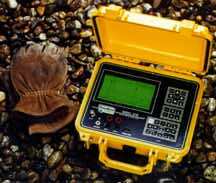 Rugged, weatherproof case for Outside Plant Applications. High contrast liquid crystal display with electroluminescent backlighting provides easy-to-read waveform information at all angles and lighting conditions. Front panel BNC and Banana Jack input connectors for testing coaxial or twisted pair cable. Transfer stored waveform information to a PC for manipulation, analysis, documentation, or to a printer. 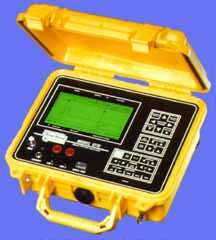 Allows the operator to move, expand, and contract the waveforms vertically and horizontally. Selectable pulse widths for testing various lengths of cable. 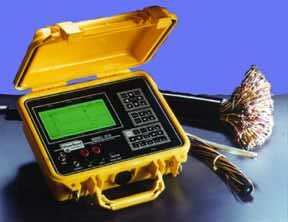 Adjustable velocity of propagation allows the operator to test all types of cable. 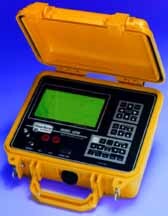 Multiple filter levels and functions provide unique testing capabilities in noisy environments. Specify display preferences and create stored waveform tagging. Automatically locates major faults and places the cursors. Move cursors independently for measurements between any two points on the waveform. Stores both on and off screen waveform information for more versatile waveform recall, analysis, manipulation, and archiving. Different display modes can be used in different situations. 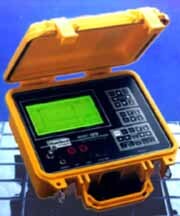 The IFD mode is used to find intermittent faults. Use the Crosstalk mode to find split pairs. Compare live Line 1 to live Line 2, or see the difference between live and stored waveforms. Locate cable and connector faults in all types of twisted pair and coaxial cables. Two line, live input for cable comparison. RS-232 Port with WAVE-VIEWTM Software for Windows® standard. Intermittent Fault Detection mode detects and diplays intermittent faults and allows the operator to manipulate and reposition the waveform without affecting the IFD function. Compact, lightweight, and portable OSP packaging. Riser-Bond Instruments has taken waveform storage to a higher level. Model 1270's exclusive SUPER-STORETM is the ultimate in waveform storage, viewing, and comparison. Competitive TDRs store only a screen snapshot of the cable under test. Model 1205T stores all on-screen and off-screen cable data, for viewing at all gain settings. Recall the waveform on Model 1270 or upload to a PC for post-storage analysis, comparison, manipulation, and archiving. Or, download the waveform directly to an external printer. WAVE-VIEWTM for Windows® is included free of charge, creating a virtual TDR on your PC. Try that with any other TDR! 17 bits with 93 dots displayed. 2000, 4000, and 6000 nsec. Four banana jacks and BNC. Distance Accuracy: +/- 0.15 m plus +/- .01% of reading. Banana Jack - 125 and 100 ohm, +/- 5%. BNC: 50 and 75 Ohm, +/- 5%. 2 digit crosstalk calculation at cursor set.